Front-end loaders (and other types of loaders) are a machinery used for loading materials into or onto another type of machinery. This is done by a bucket attached to hydraulically controlled arms, moved around by a rigid or articulated body on wheels. In mining they have multiple uses; for example they could be used for loading trucks with various materials, loading trains for export/transport, loading materials onto conveyor belts or into crushers or rolling and unrolling large cables. 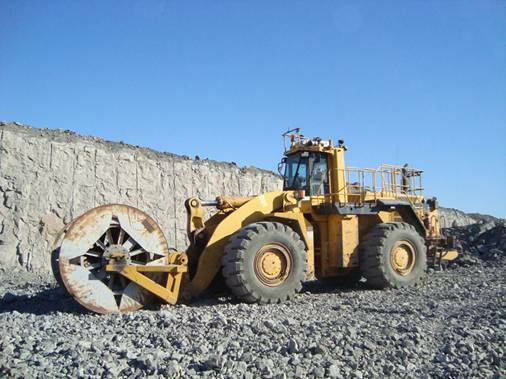 Loaders used in underground mining are referred to as 'boggers', 'muckers' or 'LHD's' (load haul dump) and are similar machines to front end loaders. For increased safety, they are commonly remotely controlled using radio links and cameras in underground operations. For more information specifically about loaders, click here. For more information specifically about boggers/LHD's, click here. 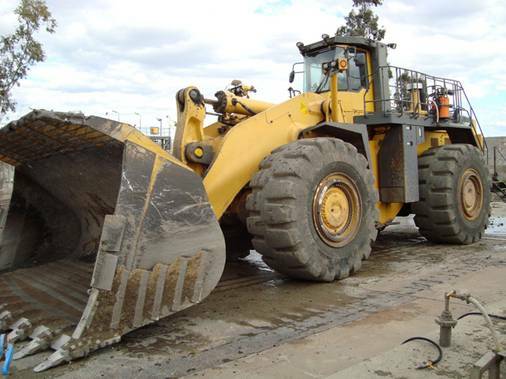 Depending on the job that a front end loader is undertaking, the survey control for them could be considered similar to that of an excavator (therefore no extra details have been included in this section).